Buying your first bitcoin is not complicated at all. But, you will still have to pay for your coffee. Just walk into a Cafe Coffee Day outlet, and walk out with a free Rs 200 gift coupon embedded with a referral code to purchase the equivalent units of the cryptocurrency. With advisories flying thick and fast about bitcoins not being a legal tender, you might still wonder what this is all about. Well, ever heard of a promotional campaign? It’s just that. But, you have nothing to lose! A host of offers awaits you – you can redeem the equivalent amount in rupee terms and move the money to your savings bank account, top-up your mobile phone, recharge your DTH account or even book a movie ticket. Well, last but not the least, you can also learn the ropes of trading on a cryptocurrency exchange and sell it at a higher value on a later date. But why is CCD in a bitcoin campaign mode? Nope. It is not. The café chain is just helping a Bengaluru-based cryptocurrency exchange services firm, Unocoin, to catch up with customers over a cup of coffee. 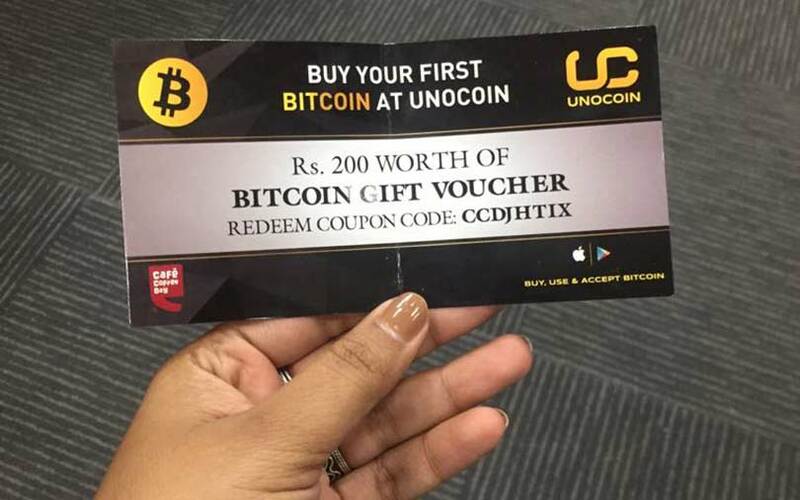 In simple terms, Unocoin has parked coupons with CCD to reach out to a wider audience. Any customer buying food or beverages from the outlet gets the Rs 200 voucher. Why is Unocoin giving it free? Promotional events are all about grabbing eyeballs, increasing user interest and expanding customer base. Simple. Instead of spending money on advertisements in a ‘negative’ environment, free coupons are a direct go-to formula to reach out to the target audience – the upmarket population in tier I and metro cities known for their networking skills. The free coupon is only a doorway to opening an account with Unocoin. To redeem the Rs 200 voucher, any which way, you will have to download the app and register on the platform before you can key in the coupon code to get access to the bitcoin units or its rupee equivalent. Once you have the fragment of Bitcoin, you can use it for any service that is available on the Unocoin platform. However, don’t be alarmed. The amount may just be a fragment of one unit of Bitcoin, but the currency allows positives of up to eight decimal places, that is, any sum in the range of 0.0000000X, to be considered as a legal denomination for the currency. What’s the use of a Bitcoin fragment? Well besides redeeming it for an equivalent rupee value and topping-up mobile and DTH services, you can start trading on bitcoin exchanges, or even transfer it to other bitcoin accounts, such as Zebpay or Belfrics. You can also use it to buy currencies of other countries traded on Unocoin or any other exchange. Spot on. Bitcoins, or for that matter any other cryptocurrency, is not a legal tender in India. According to Arun Jaitley, the government does not consider cryptocurrencies as "legal tender or coin and will take all measures to eliminate use of these assets in financing illegitimate activities or as part of the payment system". However, the finance minister’s statement does not say that trading in cryptocurrencies are illegal and, hence, for platforms like Unocoin it is business as usual. But, if it is not a legal tender how can we pay for goods and services? Well, right again. However, Unocoin has found out simple methods that do not violate the existing regulations to offer its services. For DTH recharges or topping up your mobile phone balance, Unocoin has entered into an agreement with third party vendors, which allow such transactions to go through. The company parks an amount, say Rs 1 lakh with a vendor, and as you initiate a transaction on the app, it deducts bitcoins from your account in a “selling” procedure. Then it requests the vendor to take away or release the INR equivalent of the bitcoin from the parked account in return for the recharge services or top-up. It also has a similar tie-up with BookMyShow for buying movie tickets. Technically, the process does not result in direct buying of services via bitcoin. Unocoin acts just as a mediator. In other words, it is an exchange tool for cryptocurrencies, and this is legally viable under the current set of regulations. For one, you can buy a second-hand car using bitcoins. Last week, Mumbai-based second-hand car marketplace startup Truebil had forged a partnership with Unocoin to help customers pay for cars using bitcoins. However, in this case you will have to visit the physical store. “Unocoin has given us a solution using which we can scan a bar code and then know the price of the particular car the consumer is interested in. The consumer will get a 30-minute lock on the price of Bitcoin, should he or she decides to make the purchase. The volatility is taken care of by Unocoin. Once the consumer decides to pay using his or her bitcoin wallet, the PoS can be used to deduct the crypto-asset which will be changed into fiat and transferred to our account within 24 hours,” Bansal explained, adding that Unocoin was not charging a fee either to the startup or consumers. But banks have barred cryptocurrency transactions on debit and credit cards? Yes, they have. Citibank, followed by SBI and ICICI have stopped the use of debit and credit cards to purchase cryptocurrencies, citing RBI advisories. However, there are loopholes or ways to work around it as well. One, just three banks have decided to block purchase of cryptocurrencies. Two, such transactions can be done without credit or debit cards. In Unocoin’s case, the company allows users to pay using net banking services, including NEFT, RTGS and IMPS, or use PayU’s platform to recharge Unocoin’s wallet or account. But isn’t it a risky proposition for Unocoin? According to Naveen CT, vice-president, sales and business alliances, Unocoin, the company is trying to increase the access points of cryptocurrencies in the country and at the same time expand its user base. Simply put, it wants to make your coffee payment through bitcoins a normal affair. Naveen is also of the view that this would also give the company a first-mover advantage in a market that is certainly and rapidly progressing towards cryptocurrencies.